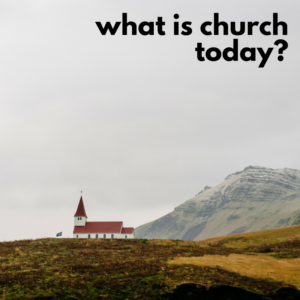 Home / CultureCast / What Does “Church” Mean Today? In this week’s episode, Christian and Amy are exploring some questions about church and get a little help from some friends. What does the church mean in the 21st century? What of our identity, systems, or traditions should be preserved or continued? How do you think the Christian religion will look differently a generation or two from now? Topics and themes discussed: intersectionality, that is, the overlap of the labels we use for people, how differentiation and the safety that brings plays out in the church today, the ingredients for dehumanization present in the church, and the curiosity of church for those in a post-church culture. Plus, holding the tension of difference and the cohesion of community, the symbol of the table, the frustration of trying to include people you disagree with, redeeming the loving mother image of God, and Amy shares some big news. Don’t miss the CultureCast live in Chicago on Wednesday, April 18th. Click here for more information and tickets.